1966 Cortex Mustang Fitted With LS7 Engine! - Muscle Cars Zone! 1966 Cortex Mustang Fitted With LS7 Engine! This 1966 Cortex Mustang featured on the 11 episode of Motor Trend Channel`s The House Of Muscle has some unbelievable attention to detail. When a gearhead invest this amount of energy and time into a build, it always pays off in a remarkable way. However, when you invested that much in a car that has been in your family for more than 50 years, then it gets even better. On top of this, if you are an engineer, then it gets even more awesome! This 1966 Mustang, also known as the “Execution” it`s a real monster on the track or the street. Every gearhead has to appreciate and love this supreme level of engineers. Every detail is flawless, from the body work, to the custom cage, to the suspension, everything. 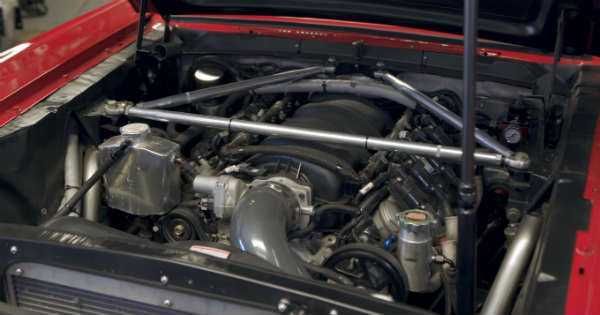 When you take a peek under the hood you`ll be pleasantly surprised when you see the monstrous Chevy LS7 lurking inside. However, beyond its remarkable classic look, there`s nothing else original about it. But, we do not care at all, because this 1966 Cortex Mustang can hold its own against supercars like the Porsche 911s and Shelby GT350R! Nevertheless, even though this beast has a V8 LS7 Chevy engine since 2006, the owner of the car is working on a Ford engine as we speak. This guy has also personally modified and designed the suspension. Not just the suspension, but almost everything else you see on this car as well. This guy is pretty honest and he says that he`s not brand loyal. We don`t care about that as well, because obviously this Mustang is fitted with the best equipment possible. And if you want to take a look at a video comparing 1965 Shelby GT350 and a new 2017 model, click here!